My father is my motivation for competing in Triathlons. He was a great man who was always the life and soul of every party he attended. 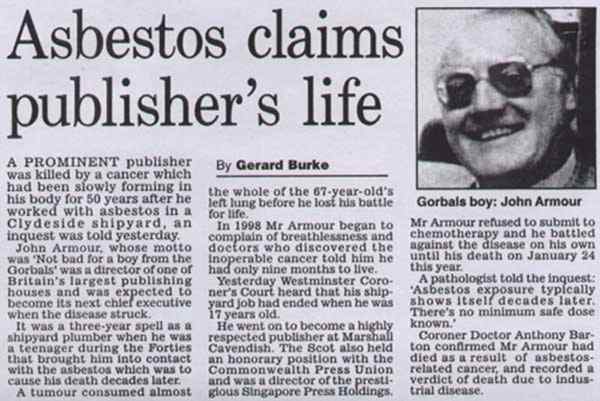 The following news clip appeared in many national newspapers shortly after his death in January 2000. Tune taken from the "Both Sides" album by Phil Collins in 1993. The track is called "We wait & we wonder". The bond between father and son is always a strong one and Dad and I were no different. He would always listen to my new crazy ideas of making my fortune and he never stole my dream. He was always open and incredibly approachable. I went to him with a Network Marketing business in the late 80's and convinced him to join me. Not only did he join, but he built one of the strongest businesses in a very short space of time. His doctor joined, his accountant joined and all at a time when MLM companies were still misunderstood and people thought it was Pyramid Selling! I really enjoyed my times with him and I miss him so much. I think most of my friends will remember him best for his bar-diving attempt at a party in Fulham in 1988!!! and his Bar BQ's were legendary!! If Dad was having a Bar BQ it never rained! I needed to get fit and I looked at many different sports and for some reason, plumped for Triathlon. Having my Dad as the main reason for raising sponsorship through the sport will definitely help me reach my goals and along the way I hope to raise an awful lot of money for Cancer Research UK. Forget "Pants to Comic Relief"......help me say "Knickers to Cancer!!" My target is to raise in excess of �20,000 by 25th December 2012! © formydad.co.uk is protected under the copyright laws of England, Wales & Scotland. This site does not make financial gain in any way and all the current links have been added for the interest and enjoyment of others at no profit to the Webmaster. If any company wishes to discuss any features or aspects within this site, then please send an email to the Webmaster.